WASHINGTON (AP) — Jake Noll wasn’t even supposed to be in the big leagues at all by now. And by the end of Wednesday, he was gathering things from his locker in the Washington Nationals clubhouse because he was being sent down to Triple-A Fresno. At least those belongings now include a game-used baseball, a memento from his first RBI — not to mention first time reaching base — in the majors. That’s because the 25-year-old utilityman who was a non-roster invitee to spring training managed to leave his mark before heading out of town, drawing a game-ending walk from David Robertson with the bases loaded in the ninth inning to lead the Nationals past the previously unbeaten Philadelphia Phillies 9-8. When Noll got to first, he was surrounded by teammates who ran out of the dugout to mob him. Then he got doused with a bucket of ice. 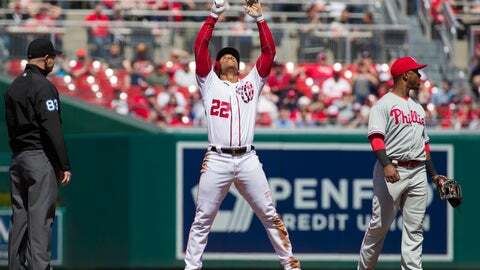 Any future such moments likely must wait: The Nationals announced after the game that Noll was being optioned to the minors. They are expected to activate veteran Howie Kendrick, who began the season on the 10-day injured list with strained left hamstring, before Thursday’s game at the New York Mets. Robertson (0-1), a free agent signed to a $23 million, two-year contract, entered for the ninth and failed to record an out. He gave up a leadoff single to Anthony Rendon, then walked three batters in a row. In three appearances this season, Robertson has allowed four runs, five hits and five walks, while recording only six outs — giving him an 18.00 ERA. He was hardly the only player who had issues at key moments for the Phillies, who dropped to 4-1 as Bryce Harper reached in all five plate appearances — two singles, three walks — while hearing constant boos in his first series since leaving the Nationals as a $330 million free agent. First baseman Rhys Hoskins was charged with an error when he failed to catch a throw that allowed the tying run to score in the eighth. And Aaron Nola gave up homers to Juan Soto, Anthony Rendon and Ryan Zimmerman, getting knocked out after just three innings in his worst start in more than 18 months. Nationals skipper Dave Martinez was not pleased, either, despite getting a victory to improve to 2-3. Victor Robles, Wilmer Difo and Rendon all made base-running blunders. Three new relievers — Tony Sipp, Trevor Rosenthal and Kyle Barraclough — combined to let the Phillies bat around and score four runs in the eighth to take an 8-6 lead in a topsy-turvy game, before closer Sean Doolittle (2-0) worked the ninth to earn the win. There was an error, along with other defensive miscues. Anibal Sanchez’s Nationals debut ended abruptly when he was removed before throwing a pitch in the fifth. That was the third time he was visited by a trainer, all connected to when he took a line drive off his right hip. He said he thinks he’ll be fine for his next start. He allowed four runs in his four innings. Nationals: SS Trea Turner went on the 10-day IL after breaking his right index finger while trying to bunt in the first inning Tuesday. The Nationals recalled INF Adrián Sanchez from Triple-A Fresno. Phillies: Open a three-game series Friday at home against the Minnesota Twins. RHP Nick Pavetta starts. Nationals: On Thursday, RHP Stephen Strasburg faces Mets RHP Noah Syndergaard for the second time this season. Neither factored in the decision when the Mets beat the Nationals 11-8 last week.